This time of year is strange for a Midwestern girl in California. I’m sure I’ve said this before, but it’s feeling particularly true this year. I keep forgetting what month it is, and a season that always held a certain role in my life is, for all intents and purposes, absent. Rainy and gray days can stir up the same feelings I recall from years of Michigan winters, but this year has lacked even that. Now, don’t get me wrong, I am very glad that I’m not buried in snow, constantly cold, scraping ice off my car every morning before work and/or suffering from a severe lack of vitamin D. I don’t miss any of that. But I do miss the seasons. I have always loved them, for the rhythms they both bestow on us and reflect. It’s strange to be without the time of reflection and hibernation and realizing I’m strong enough to handle it that winter provided me for years. Midwestern people, you may have noticed, are tough. Those winters might be brutal, but they churn out some seriously resilient people—a trait I don’t want to lose in the midst of year-round balminess. I crave definition for the seasons I go through in life. And the truth is that I’m not really sure what this winter was about. Ben and I have both been busy with work. We had a wonderful, mellow holiday visit back home. I turned 28. The slicing-my-finger, evening in the ER incident definitely stands out in my mind. We tidied the apartment in a serious way (more on that some other day, perhaps!). I rediscovered the delight of baking. We ate some really amazing meals. But an overarching picture? I don’t see one. I had a conversation with friends last week about the fact that we don’t need to find immediate meaning for our experiences, and that if we’re feeling pain, the bow doesn’t need need to be tied on the situation in any timely way, if ever. I keep repeating this to myself. Spring is coming, after all, and that never ceases to be profoundly meaningful to me, even in the California sunshine. A friend of mine who grew up in Detroit told me that she was talking to her sister recently, and her sister, who still lives in Michigan, asked what she’d been up to that day. “Oh, we had a picnic by the lake,” my friend replied. Her sister erupted, “A picnic? We’re fighting for our lives over here, and you’re having a picnic? !” Which is fair. Michigan people: I’m in your corner, wishing you meaningful winter hibernation vibes to get you through. But we all are fighting for our something, aren’t we? Everyone’s in the midst of a season. Even if your challenges are the everyday sort, which are nothing to scoff at: we’re all trying to pay our rent and raise our children and do meaningful work and be kind and live in a way that matters. Living, if you ask me, is no small feat. Enter brownies, appropriate and helpful in all times and seasons, whether cold or confusing or celebratory or just plain impossible to define. This recipe is one that you should be able to make from what’s already in your pantry—forgiving in the kindest and most generous sense. I hope you’ll make them. I think they’ll help. Any cocoa will work for this recipe, so there’s no need to worry yourself over the distinctions between natural and Dutch process. I love how Medrich, queen of chocolate, perfected the proportions of fat and sugar in this recipe by using cocoa instead of chocolate. This is a simple recipe that yields a highly delicious treat. Position a rack in the lower third of the oven and preheat the oven to 325 degrees. Line the bottom and sides of an 8-inch square baking pan with parchment paper, leaving an overhand on two opposite sides. Combine the butter, sugar, cocoa and salt in a medium heatproof bowl and set the bowl in a wide skillet of just-simmering water. Stir occasionally, until the butter is melted and the mixture is smooth and hot enough that you want to remove your finger fairly quickly after dipping it in to test. Remove the bowl from the skillet and set aside until the mixture is warm, not hot. Stir in the vanilla. Add the eggs one by one, stirring after each addition. When the batter is thick, shiny and well blended, add the flour and mix until you cannot see it any longer. Beat vigorously for 40 strokes. Pour the batter into the pan, smoothing the top. 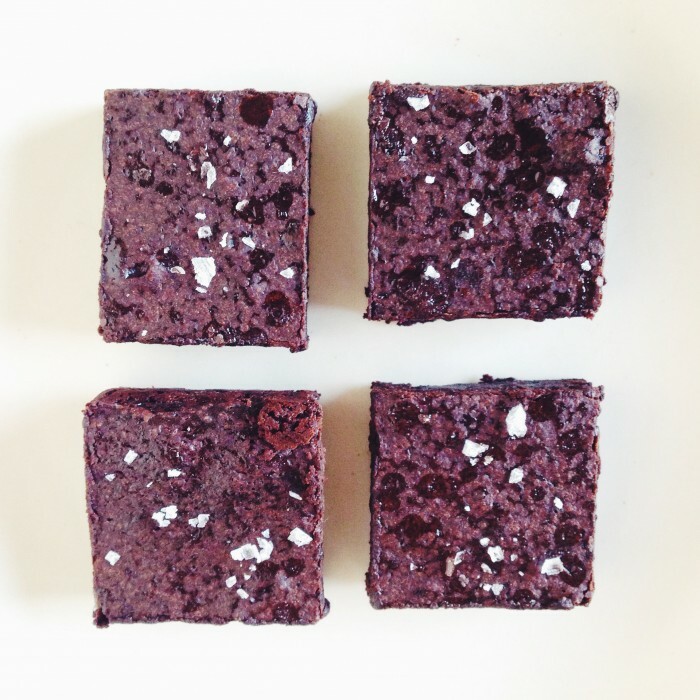 Sprinkle on the cacao nibs, if using. Bake until a toothpick plunged into the center emerges slightly moist with batter, 20 to 25 minutes. Sprinkle with flaky sea salt, if desired. Let the brownies cool completely on a rack. Once they are cool, lift the parchment and transfer the brownies to a cutting board to slice and serve. I’ve made Alice Medrich’s brownie recipe at least fifty times, and they always turn out beautifully. I like your idea to add cacao nibs to the batter. I’m with you on this one, as a California native! Our seasons will always be more subtle than other parts of the country, but I also feel like Im floating outside of a cycle or a context with these relentlessly sunny days in the middle of winter. I miss our mild but palpable winters, with their frosty evenings and grey days and rain. Have you heard of the Ridiculously Resilient Ridge? That is, apparently, the cause of all this weather, and our persistent drought. Remembering that everyone is in the midst of some season…a good policy for how to interact with people. 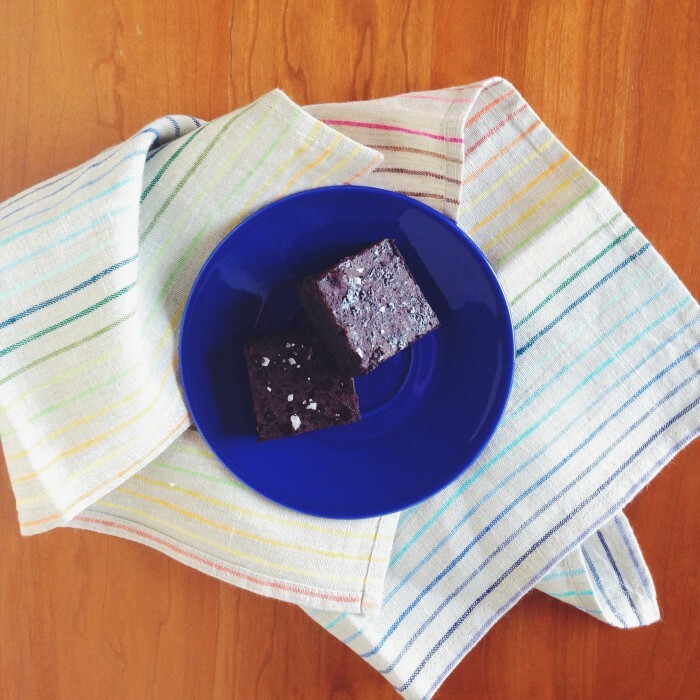 I loved this post, and I love these brownies! Very rich post, with a rich treat to have while contemplating it. A good reminder that one person’s season of picnicking can happen while another person is experiencing a season of fighting. I hear you. Even as a Californian, I find the lack seasonality we’ve had these past two years to be very odd and disconcerting. While I love the sunshine, sometimes I’m consumed with the feeling that it just isn’t right. Where’s the rain? The chilly gray days? So looking forward to hanging with you next week!